There are many ways to get active and you should get active any way that makes you feel the best, but we want to talk about one of our favorite activities, rock climbing. Maybe you climb all the time, maybe you’ve tried it once or twice, maybe you’ve never had the chance. But we plan on doing more climbing for a few empowering reasons. Whether climbing inside or outside, climbing works your muscles and your lungs. It builds strength and stamina, and gives a cardio workout. You workout every muscle group in just one activity. Climbers use strength in their arms to pull themselves up, and their core and legs to practice balance. Constructing a total body workout takes time, this way our body gets the workout and we don’t have to worry about piecing together exercises to work each muscle group. Climbing also improves flexibility, it increases our range of motion and those out of reach routes get closer every time you practice. It is recommended that you stretch a few times a week or practice yoga to increase this flexibility and prevent injury. One of the many benefits of exercise is the action of release. Releasing all the tension of the day and stress we hold onto from the grind. Climbing can help give us a sense of exhilaration, the leaping and reaching and accomplishing each step at a time. Climbing also works our problem-solving skills, working out minds at the same time as our bodies. Testing our skills of routing that will get us to our destination, and adding hand-eye coordination to the docket. Climbing also helps us conquer fears. We see an obstacle related to height and the unknown, so we take control and overcome that fear by using our minds to calculate a route our body can overcome. This helps build confidence and self-reliance. There are the obvious benefits of some exercises and the not so obvious. Climbing also gives us social exercise. A sense of community can be a huge boost when de-stressing and striving to new heights. Studies show that having a community helps with health behavior changes like exercise, weight loss, and improved nutrition. When we are faced with a challenge, having an encouraging community helps us overcome our own fear and doubt. Climbing gyms give that place of support to grow your practice and eventually help others. "I have always been an active person that values the long-term benefits of an active lifestyle. Since I started climbing, my appreciation for a healthy and active lifestyle increased significantly. Rock climbing, indoor or out in nature, is much more than a workout, it is an amazing all body and mind experience. When I climb, I pay attention to every move, to my surroundings and the people around me. Climbing requires a high level of focus and mental stability, it makes me want to push beyond my limits while listening to my body and committing to the journey. One of my favorite things about climbing is the community. There is nothing more empowering than the sound of other climbers cheering you on and encouraging you to try." Accomplishments give us a natural high and the confidence to achieve more. When we have the encouragement and desire to leave our comfort zone we can accomplish even greater things. Every route you fulfill on the climb helps you get ready for challenges in life. Climbing gyms are a great place to start, but once you have some experience, climbing can take you on outdoor adventures beyond a normal hike. Outdoor exercise improves mood from literally soaking up the sun in the form of vitamin D. (But be sure to protect your skin from prolonged exposure. Link to sunscreen blog) Nature helps us relieve stress and can help give us perspective on things we stress about every day, all while boosting self-esteem even more. Bonus, it’s a low cost form of exercising! We’ve learned a great deal about the climbing from our friends at Static Climbing, and are excited to partner with them on a chalk bag that will support our work and give people a tool to get Fit 4 Prevention. We’ve teamed up with Static Climbing and they’ve created a chalk bag that supports it’s amazing community and our work. "We are excited to partner up with NTR to help spread awareness by creating a hand made custom waxed canvas chalk bag. 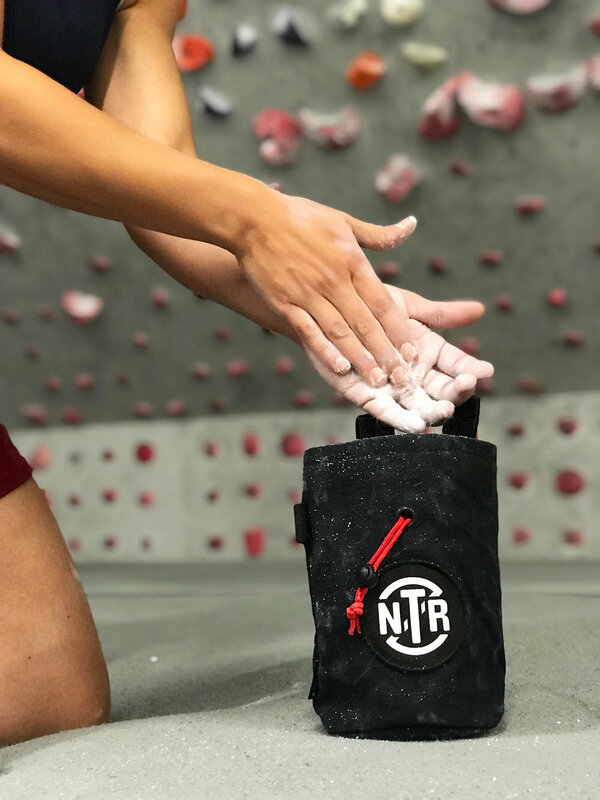 STATIC will donate $10 from each NTR chalk bag sold." We asked Taylor from Static Climbing a few questions about her journey with Keep A Breast, climbing, and creating these amazing bags. The climbing world has impacted my life in more ways than I could have ever imagined from being the best overall workout to stay healthy to being apart of a really amazing local community. Climbing has also allowed me to be creative and have a career doing what I love! Why did you start making chalk bags? While I was an intern at Keep A Breast Shaney and her amazing team showed me how to run a company with integrity, passion, and creativity. From everyone I was surrounded by I was inspired to try something new. I learned how to sew in April 2014 and started making chalk bags hoping to bring a new spin to them by using different textiles and fabrics. From what started as a hobby has been one non stop adventure since then! What advice would you give someone getting into climbing? The best advice someone gave me when I started out is to climb the climb not the grade. Climbing pushes your physical strength as much as it tests you mentally and if you're having fun you'll enjoy climbing so much more! We are so grateful to Static Climbing for their generous donation, you can find the bag on their website. *When starting a climbing practice, start at a gym under supervision and with the correct safety gear before attempting this practice on your own.